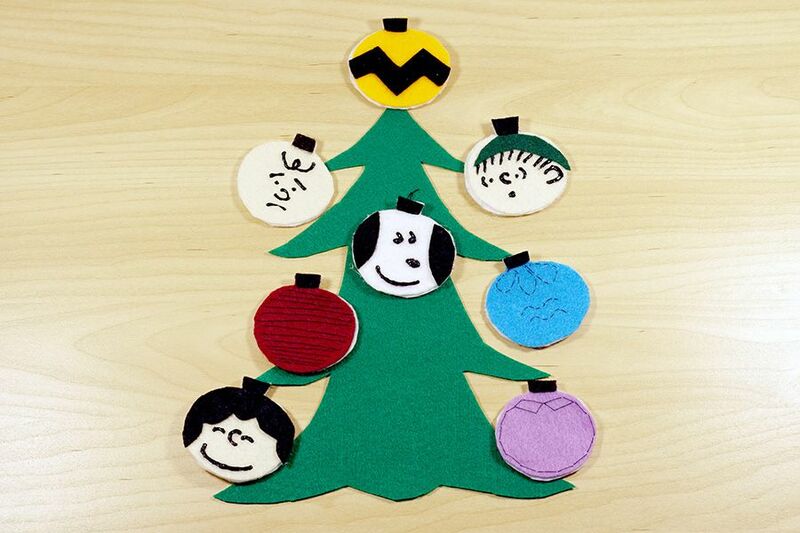 These adorable felt ornaments bring the joy of the Peanuts Christmas classic right to your very own tree. The great thing about these ornaments is that they can be accomplished in a lot of ways. You can add or substitute characters based on your preferences. Create these ornaments with a simple hand stitch and puffy paint. If you aren’t totally comfortable with a needle, you can easily do all of the stitched designs with puffy paint or even a black fine-tipped permanent marker. This project was inspired by A Little Gray. Lucy’s hair: get creative with her curls! Cut out the paper patterns. Trace the ornament pattern on white felt nine times, on peach three times, and once on red, blue, yellow, and purple. Trace the small rectangle on black felt eight times. Trace the two ovals on black felt. Trace the moon shape on green felt one time. Trace Lucy’s hair on black felt one time. Cut out all of the felt pieces. Thread the needle with black thread about two feet long. Knot one end of the thread. Start at the top of the red ornament piece and pull the needle through from the back to the front so that the knot stays on the wrong side. Cross the ornament in one long stitch and pull the needle through to the back. Position the needle about 1/8 inch below and pull through to the front. Cross the ornament in one long stitch to the opposite side. Repeat until the stripes reach the bottom. End with the thread in the back of the felt and knot the string. The stripes will be a little loose and should be a little uneven and crooked, and that’s okay. It adds to the Charlie Brown feel! Thread the needle with black thread about 2 feet long. Knot one end of the thread. Start at the top of the blue ornament piece and pull the needle through from the back to the front again. Use small stitches to sew the pattern of three ruffles along the top of the ornament, coming out of where the rectangle will be placed. End with the thread in the back of the felt, and knot the string. Cut the excess thread loose and knot the end again. In the middle of the ornament piece, pull the needle through from the back to the front. Use small stitches to sew a wavy line in the center of the piece. Sew another wavy line about 1/4 inch below the first. Start at the top of the purple ornament piece and pull the needle through from the back to the front again. Use small stitches to sew the pattern of a collar right below where the rectangle piece will be placed. Continue with small stitches around the perimeter of the ornament from the outside corner of one side of the collar to the outside corner of the other side of the collar. Use the hot glue gun to glue eight of the white felt ornament pieces to the back of the other eight ornament felt pieces. This helps with stability and covers up the messy backs of the stitches. Glue the eight rectangles to the tops of the ornaments. Glue Snoopy’s ears on the ornament with the white felt front. Glue the zig-zag felt piece to the yellow ornament. Glue Lucy’s hair to one of the peach ornaments. Glue Linus’s cap to one of the peach ornaments. Using the black thread and needle, sew a loop onto the back of the ornaments so you can add a hook. Use a pencil to draw faces of Charlie, Linus, Lucy, and Snoopy onto the peach felt. Puffy Paint over the pencil lines. Let the ornaments dry overnight.